The Horror Digest: Psycho: At Least He Keeps the Place Clean. 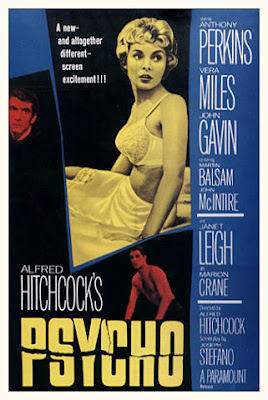 Rear Window will always be my personal favorite Hitchcock film but I just loooooove Psycho. It's Hitchcock's most visceral film. And it has one of the most creepiest shots ever. When Sam is yelling for Arbogast and they cut to Norman Bates at the swamp. The slow move in on him is just so terrifying to me. Rear Window is so fantastic it hurts my head! I don't know why I haven't done a post on that....hmmm! I became a Hitchcock nut after watching Psycho while on vacation in the 2nd grade. After that I rented almost every single film that the library has of his- which was A LOT. Those were the days! "If you haven't seen this you deserve to be punched in the head." Just stumbled over this blog. Anyone who would make the above statement is okay by me!